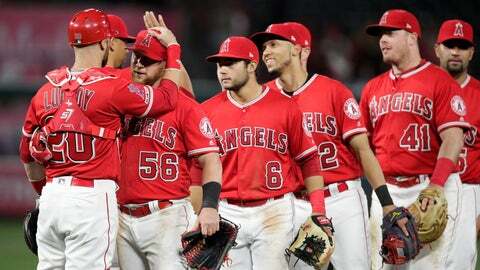 Missing star outfielder Mike Trout, the Angels defeated the Milwaukee Brewers 4-2 as they scored all their runs on four hits in the third inning. Justin Bour keyed the outburst with a two-run single. Los Angeles (7-6) is over .500 after beginning the season 1-5. Trout, who strained his right groin during Tuesday’s victory, said he hopes to be available for this weekend’s series in Chicago against the Cubs. “We had a rough home opener and since then the offense has picked up. The bullpen has been consistent all the way through,” Angels manager Brad Ausmus said. Bour is batting only .154 in his first season with the Angels but had a solid series against the Brewers. He was 3 for 10 with a home run and four RBIs as Los Angeles completed a three-game sweep. “It was an amazing homestand and it took all of us to win,” Bour said. Despite being swept, the Brewers (8-5) remain atop the NL Central two weeks into the season. Pujols played in his 1,000th game for the Angels. The former Cardinals slugger became the 10th player in major league history to play at least 1,000 games with two teams. Ausmus indicated Ohtani is still on track to return in May. Ohtani has not started running the bases and said he is still in the very early stages of throwing.